Mulberry leaf is getting attention as food ingredient for losing weight or measures for high level of sugar. The information of its efficacy is old, it is said that herbalism is the first literature. In “Shin-nou honsoukyo” written in China in the second century, mulberry leaf dried in the shade was named Shinsen tea, and it is effective against common cold, pertussis, paralysis, diuresis, and so on when you take this tea. It is also perceived to be good for high blood pressure and nutritional fortification. Besides, in the Kamakura Period in Japan, in the second volume of “the Kissa Yojoki” (Drink Tea and Prolong Life, a Note on Drinking Green Tea for Good Health), which is the first literacy and pharmaceutical book written by Eisai Zen master who is the founder of the Rinzai Zen sect, he explained that “it is certainly efficient for water drinking illness (diabetes) within three to five days” when you take mulberry porridge and mulberry hot water. (Water drinking illness is that you feel thirsty how much water you drink.) Since a long time ago, it has been eaten as the efficient food for health with their real experience. Mulberry leaf belongs to the genus Morus of the family Moraceae, and is garden crop being widely cultivated mainly for silk culture as food of silkworm in warm climate till tropical regions. It is perceived that silk culture is started at Chang Jiang and the Yellow River watershed in China. The history is from as far back as five thousand years ago. It was 200 years before Christ when sericulture technique was come down in Japan and it was after the end of Edo era when sericulture was fully recommended. From the end of Edo era till the beginning of 1900s, silk industry was developed depending on Japanese sericulture technique and it supported Japanese economy as their valuable export industry to earn foreign currency. After the Second World War, however, once technology of artificial fibre such as nylon or rayon was established, Japanese silk industry headed for decline. 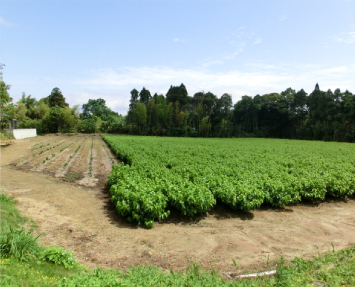 At the same time, “mulberry farm” also gradually disappeared from Japanese scenery. In mulberry leaf, it contains an active component DNJ (1-deoxynojirimycin). It has become obvious that this component prevents absorption of sugar and that controls the increase of sugar level in the blood after the meal. The lesson of Eisai Zen master and ancient people is proven by science. Mulberry leaf possesses solid utility and has protected health of ancient people. 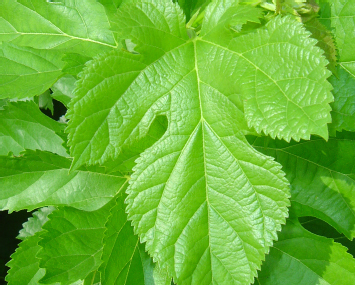 We realize the big possibility and attractiveness of mulberry leaf to solve the health problem for the modern people. We aim at commercializing mulberry leaf and informing it to the people in all over the world. A summary of action of an active component DNJ. In mulberry leaf, it contains a characteristic component DNJ (1-deoxynojirimycin). The other plants than mulberry also contain slight amount of this DNJ, but only mulberry leaf contains rich amount of it. The chemical structure of DNJ is very similar to glucose sugar, and oxygen atom in endocyclic raffinose is placed to nitrogen atom. 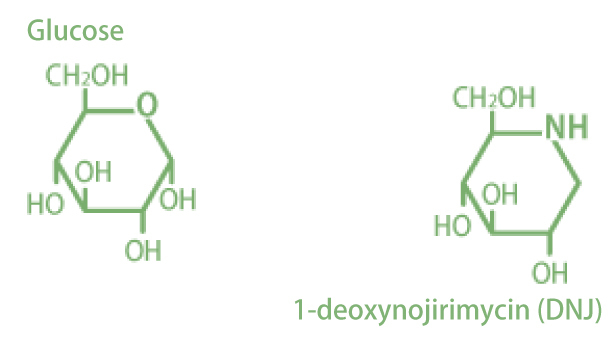 In this way, as the chemical structure of DNJ is very similar to glucose, maltase or sucrase in the small intestine, which is related to absorption of sugar, is giving competitive inhibitation, and that inhibits dissolving of monomeric sugar from disaccharide. After taking sugar content in, it is dissolved by digestive enzyme and is absorbed monomeric sugar from the small intestine. Thanks of DNJ, however, as it is not absorbed in the small intestine by being inhibited the breakdown of disaccharide to monomeric sugar, a sudden rise in sugar level in the blood is suppressed after the meal. The sugar content which is not absorbed in the small intestine carries to the large intestine, and it is dissolved by bacteria existing in the large bowel. At that time, the large bowel is stimulated and the bowel movement is improved by arising of carbon dioxide gas or hydrogen gas, and being produced of organic acid such as acetic acid, lactic acid and so on. The control effect of sugar level in the blood after the meal with mulberry leaf. 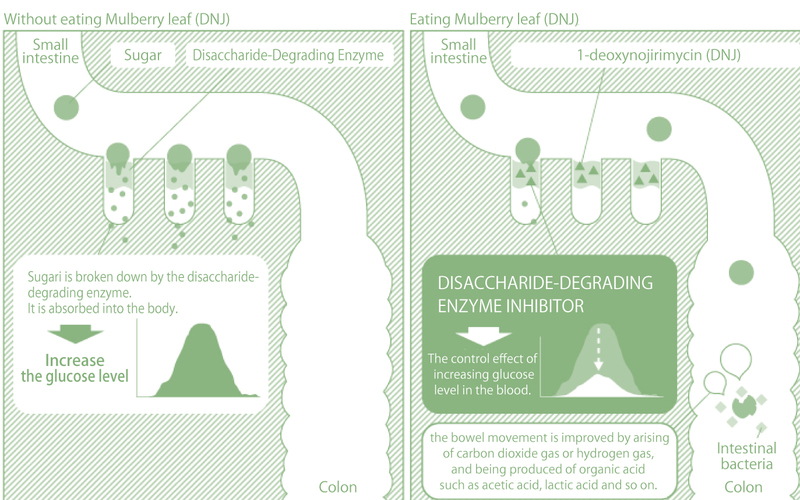 Target in five healthy subjects (Male 3 people, whose average age of 38 years old, Female 2 people whose average age of 26 years old), we have confirmed the control effect of glucoses level in the blood after eating powder of mulberry leaf including DNJ. The subjects ate 50g of saccharose and in the experimental section, they took 0.8g or 1.6g of mulberry leaf powder at the same time. 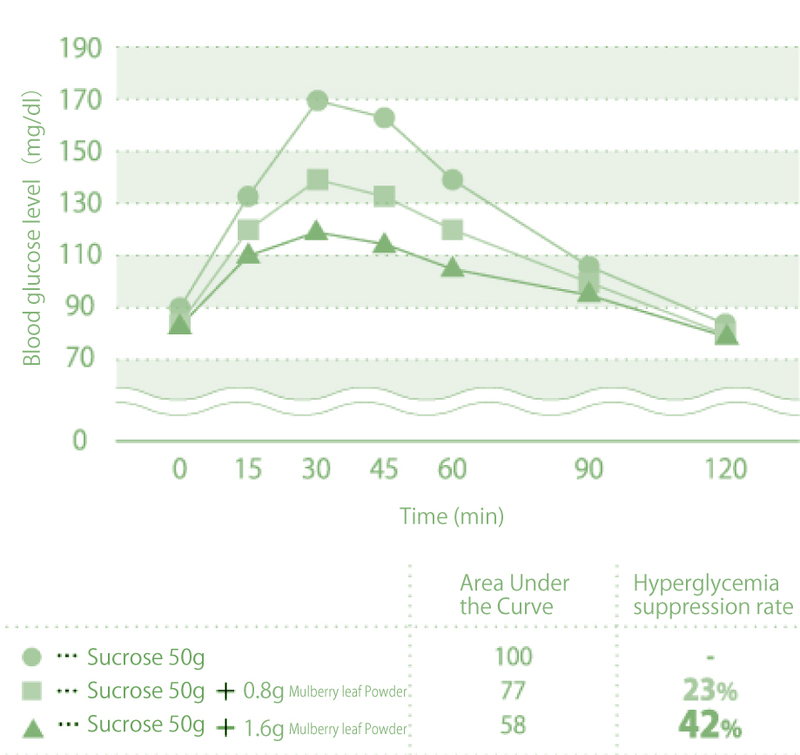 In the result of measuring blood sugar level up to two hours after eating saccharose and mulberry leaf powder, the elevation of blood sugar level was significantly inhibited by taking mulberry leaf powder. The inhibition ratio, as area under the curve (AUC), was that taking 0.8g of mulberry leaf powder was 23%, and taking 1.6g of it was 42%. 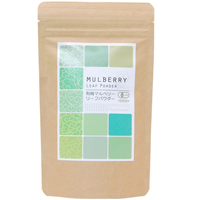 As elegant mulberry tea by melting in boiled water. For smoothies, yogurt, desert, sauce of dish or colouring. Mix into the dough of bred, muffin, cake, cookies and so on. Eat it in accordance with your taste. It is simple taste and delicious with the flavour like Maccha (Japanese green tea) with less bitterness.